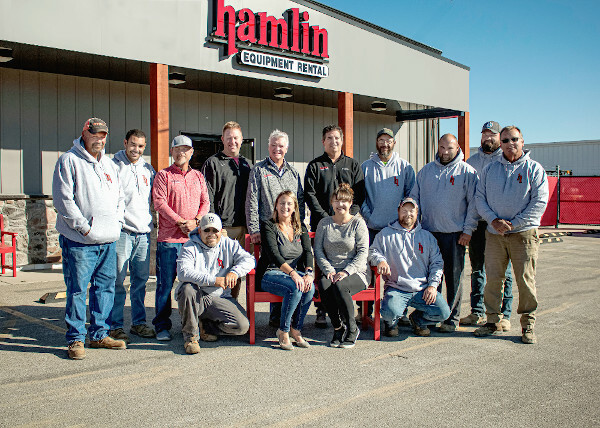 Hamlin Equipment Rental officially opened its door in 1988 with one focus in mind: To be the best in customer service! We have established honest and open dealings with our customers while providing added value to every sale and rental. With over 152 years of collective experience in the construction business, we find the solutions to your construction needs. We are there before, during and after the sale to develop lifelong customer relationships. Our constant attention to details and service keeps our inventory of current, top of the line equipment in excellent working order to limit unnecessary downtime for our customers. At Hamlin Equipment Rental, our motto says it all: "SERVICE IS OUR MOST POWERFUL TOOL"
We offer equipment rental and tool rental from top-line manufacturers including John Deere, Takeuchi, Komatsu, JLG, Husqvarna and Wacker Neuson. To assist with your surveying needs, we specialize in rental, sales and service for lasers, levels, and transits. For shoring and trenching, count on our GME equipment to keep your site and workers safe. We support our equipment rentals and all your projects with sales of construction, safety, survey and concrete supplies. Our extensive inventory of parts will help keep your equipment up and running efficiently. We hope you consider Hamlin Equipment Rental for your next project, big or small, in the Tri-State area!